A team of University of B.C. researchers is peddling a new "bikeability index" aimed at pushing urban planners to design more bike-friendly cities to promote healthier communities. The new tool rates municipalities on their bike friendliness, based on the number of bike lanes, hills, street connections and cyclists' access to school, work or other destinations. Not surprisingly, Vancouver tops the list, along with New Westminster and Burnaby because they have the most bike paths. Anmore is not considered an easy ride, nor are Maple Ridge, the Township of Langley or West Vancouver. Even Delta, while fairly flat, didn't score as high because its land-use practices do not encourage trips by bicycle. "Making cycling easier will make it more attractive to a larger proportion of the population," UBC researcher Meghan Winters said. "It's to help motivate people to cycle by avoiding gridlock and traffic and [finding] the easiest way from point A to B." The index, funded by the Heart and Stroke Foundation and the Canadian Institutes for Health Research, was based on a public opinion survey of 2,149 adults, travel behaviour studies, and focus groups looking at key factors that influence cycling habits. It highlights the differences in cycling infrastructure across Metro through online colour-coded maps. Many surveyed said they were motivated to bike on flat, separated bike paths with beautiful scenery away from traffic noise and pollution. They also prefer trips less than five kilometres and want to take their bikes on SkyTrain. Secure indoor bike storage was also a plus. 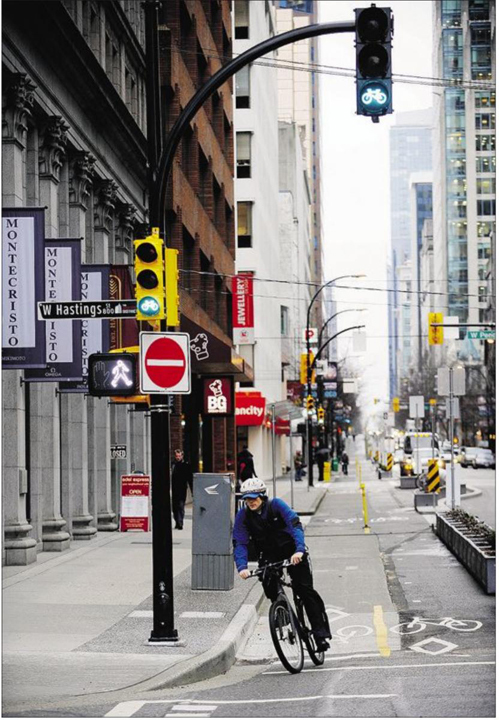 In Vancouver, which is developing separated bike pathways downtown, and has bike routes criss-crossing the city, cycling has become the fastest growing choice of transportation, said assistant city engineer Jerry Dobrovolny. About 60,000 bike trips are made every day, and over 3,500 cyclists commute to work downtown. The reasons vary, from health to economic or environmental, Dobrovolny said. The index will provide more information, he said, as the city works with health officials on its cycling strategy. "There's obviously benefits for active transportation beyond the city." Metro Vancouver municipalities such as Port Moody, the Township of Langley and the City of Surrey are also developing cycling plans. Surrey has more than 200 kilometres of bike lanes and is working to connect its various town centres. In Langley Township, people go for country rides because it's so flat, but the vast distances between town centres make it difficult to commute, said Mayor Rick Green. While the township eventually wants to boost its cycling network, he said, right now "we need our cars." Jeff Sommers, manager of research and health initiatives with the Heart and Stroke Foundation B.C. and Yukon, said the bikeability index should help cities as they curb urban sprawl. "One of the reasons why we see the level of biking in the central city [Vancouver] as so much higher is because the type of destinations people are going to are so much closer," he said. "If you live in Langley and work in the city, it's difficult to cycle." But if people can hop on a bike and it's easy to get to where they're going, he said, it would make a huge difference. "There's clearly a relationship between inactivity and heart disease and stroke ..." he said. "The less you walk or bike, the more people tend to weigh."